We all want students to know how to annotate and automatically do it when they are handed a piece of literature. 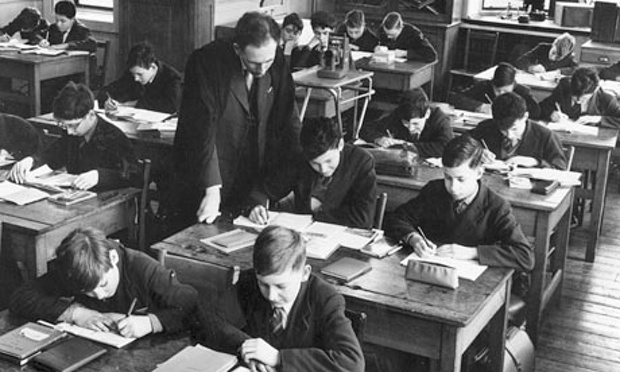 The trouble is, for most students annotation is something they do for the teacher, and not for themselves. They don’t take any ownership of the process and don’t see any payout at the end. I got a harsh lesson on the value of annotation this week. I was teaching “Ozymandias” and after I printed off the poem, I read it over, said to myself, “I got this,” and proceeded to teach a very mediocre lesson on a great poem. I thought I knew it, but I hadn’t internalized it. This is the value of annotation. If I had taken time to annotate, I would have extended my knowledge beyond what I thought. And I want my students to understand the value of this activity for reaching a deeper understanding of whatever they read. However, they need some strategies they can use since it’s not a natural task for them. 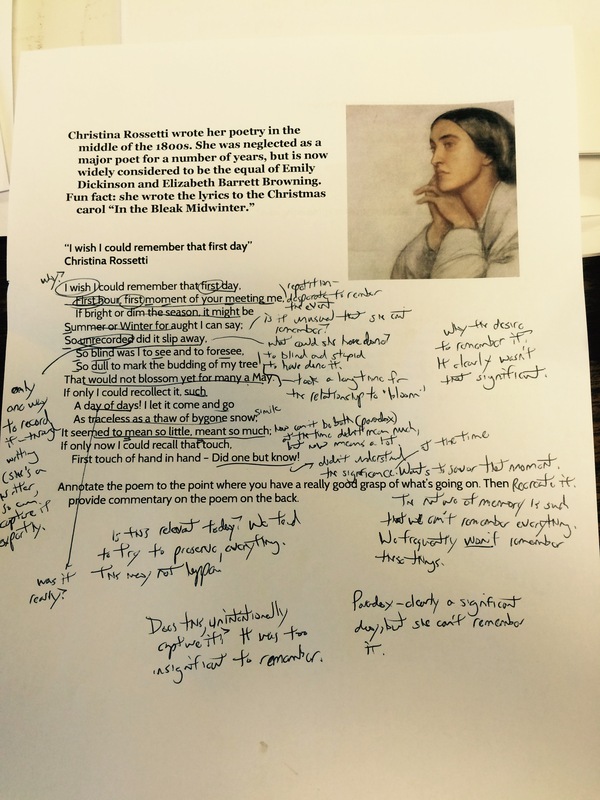 The next day I was teaching “I Wish I Could Remember That First Day” by Christina Rossetti and the night before, I annotated the heck out it. I thought that this would be an excellent time to think about what I do to annotate and help them with some strategies. The nice thing about poems is that they are short, so you can go over and over them in a short amount of time. Read the poem a couple of times without doing anything. I’m just getting the lay of the land. Recreate the poem in writing. This is when I start to write. Read the poem and retell it as best I can. There will be parts that don’t make sense, but I’ll leave them alone for now. With this reading I establish that the speaker is in love with someone and wishes they could remember the first time they had met. I also determine the tone: she is very regretful that she can’t remember this. Ask questions. In this reading I begin to play devil’s advocate and see how far I can push the poem. I came up with questions such as these: Why does she want to remember this event? Will she be better off if she could? What were her options for preserving this memory at the time? I might also start to answer these questions. Think about the larger significance. I pondered whether or not it was easier for us to remember all of the events of our lives because we are able to record so much and actively do so. At the time Rossetti was writing, you could write stuff down or hope you remembered it. Today, we actively curate our lives with photographs and social media. Or perhaps this puts more pressure on us if we miss something because we have so many ways to capture it? This can be done at any time, but I like to find words or phrases that I find interesting. Sometimes they are phrases that are great description, or an interesting word choice, or something I can’t quite figure out because it seems so puzzling. Finally, I go back and look for literary devices or the rhyme scheme and see if I notice anything that strikes me. I f I really want to analyze the use of them, I’ll dig a little deeper. I’ve got a good understanding by this point, so now I have a context for the use of them. In my mind this seems like a better way to approach annotating a poem that the more pedantic approaches I find online. Most approaches start with identifying words you don’t know, looking at literary devices, finding things that stands out or confuses, and so forth. Content seems almost secondary – you’re just encouraged to label everything you can. But I find it helpful to just dig right in. You can look at the construction after you have analyzed the poem and have better luck finding out why the devices are used that way. For some great comics about great poems that you could annotate, visit my Teachers Pay Teachers store.